Hi folks, I've just returned from Mexico and I can't believe how much I missed sharpening knives. Fortunately I have a bunch of dull knives waiting for me to fix up. "What the most important thing about learning to sharpen knives is, what is the one thing that is critical to success"? The question was easier for me to answer than I thought it would be, so here it is"
Basically, I told him that there are two answers, one deals with the mental side of the process and the other deals with the physical act. Without any doubt in my mind, PASSION is the number one thing on the emotional side of things. This may sound a little corny but I honestly believe this as I think about my own sharpening journey. Passion is an attribute that drives people to be successful in whatever it is that interests them, from knife sharpening to collecting stamps. It is the engine that drives us. Being passionate about something is like having the combination to a number of locks, as the interest grow, you unlock more doors and you discover more. You get better at it and this keeps you going. If I wasn't passionate about knife sharpening, you would never have heard of me, I would not be a successful sharpener. You just need a little passion too, that's all. You already have that, if not, you wouldn't be reading this. Also, we are drawn in by passionate people, we respect them for what they do regardless of what is is. I am always amazed by folks who can create beautiful things out of wood for example because I just don't have much skill in that at all. m not as interested in it as I thought I would be but if I was truly passionate about learning, I know I would be able to play the guitar. So in my experience, I know that I am a better sharpener because it isn't just a job, it isn't just taking money from people. I would be miserable if that was the case and I wouldn't have too many customers either. When I am teaching folks to sharpen, ( I only do one on one classes), the people who are able to hold the knife steady achieve success more quickly. So being consistent with your angles (whatever the angle is that you are holding the knife at) creates very sharp edges, and it is something you can see in the bevels and something you can feel when you touch the edge. Consistency is a skill you can develop, you must develop it, you must work at it and as your muscle memory improves your consistency will as well. 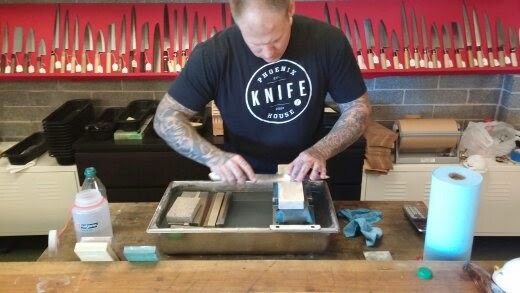 In this picture you see Corey from the Phoenix Knife House sharpening with impossibly consistent angles and achieving edges that are truly wonderful. We don't out sharpening with the ability to create consistent bevels and hold inhumanely precise angles. We develop this skill by repeating the process over and over and for some, this will take a long time because for some, sharpening knives doesn't consume their lives like it does me and no doubt Corey as well. There are other important skills to have when it comes to sharpening knives of course but in my opinion, consistency outweighs the others. Now someone may say, having an understanding of what it is you are trying to achieve when sharpening is the most crucial component. I tend to agree with this, however, once you have that understanding, that is a box you can check off. Consistency doesn't come from someone telling you to be consistent. 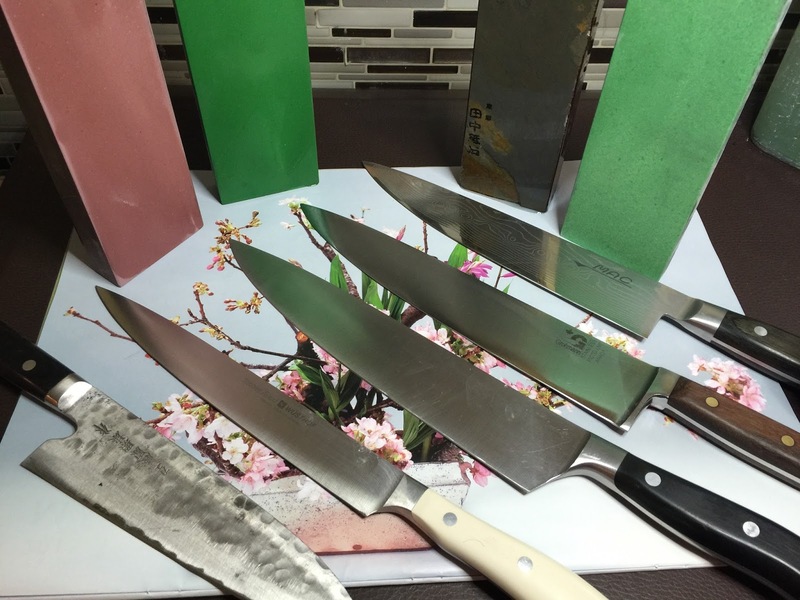 It comes from practising and being persistent and of course being passionate about sharpening will lead to more practice and more persistence. The cool part of this is that you don't need a whole lot of these things to get started, you can still get a knife sharp with just an ounce of these personal skills. Once you get started on the right track, things like consistency and passion just build and build. In other words, you don't need to go out and buy five of the best water stones in the world and you don't need to devote your entire life to practicing to be any good at it, just take small steps and don't overwhelm yourself. I'll be back soon, just wanted to touch base after being away for two weeks. Thank you for waiting. Welcome back! That "passion" is at the same time necessary and dangerous. Someone giving a long while to tell apart two different noises (the ones that the edge produces over the stone), or different results on a 10X (sometimes more...) loupe definitely needs passion. But passion is dangerous as well. Sometimes this passion pushes you towards spending more money than adviseable, or taking more risks than necessary (not only financial ones, I mean). So you have to have this passion, but under control. Ditto on the Welcome Back! Just wanna say Thanks for keeping such an Excellent Blog! I get a lot of good information from reading all the previous posts. Thank you folks and yes anonimo, passion can and has led me to purchase items I wanted more than I needed and to spend more time than I probably should have sharpening. I can remember waking up my wife once at 2am to show her a knife I had just done, she didn't share my enthusiasm. Gregg, I am very appreciative that you took the time to make a nice comment and if you would like me to talk more about the Edge Pro I can and probably I should. Using the EP made me a better freehand sharpener, no doubt about that. I'll think of something useful and post it, I don't like to post articles and waste anyones time, I want people to get something from them , even if it is one person.